That is such a cute and pretty bag! It's quite similar to the red one you have already. You've got a nice Rebecca Minkoff collection. Enjoy your weekend with your boys. Yes, you really should wear printed tank tops more often! I like the first look and think it is perfect for a busy day you had on that day. Also the second look is beautiful. I know what you mean that on sad days colours help to cheer up the own mood. Your little boy is so cute! You can never beat a denim jacket like this one! Both perfectly layered looks! Those two bags are super cute and loving both the colours hun. Oh I love the classic black maxi skirt! It looks really cute how you've styled it with the denim jacket. Hope you have a great weekend, Mica! What a wonderful event, and your son made me laugh...they really are gems, aren't they?? I love that orange bag, Mica!! It adds so much fun to any outfit! I just retired my maxi dresses and skirts. We get a lot of rain through the fall and winter, so anything that is close to the ground doesn't work anymore. We are lucky it doesn't get that wet over winter! Summer is more our wet season! Loving both of these! The bright one is so happy and exciting and the first is definitely my style with the darker hues! You wear the denim jacket so well, Mica! It's such a great, handy and versatile piece to have in a wardrobe - during any season of the year! Hope you've had a wonderful week babe! The orange bag is so cute, dear! These are great outfits! That R.M bag is so beautiful. The shade is gorgeous and the design is very elegant. A perfect bag! I'm sure you'll get a lot of wear from this lovely bag. It's so nice how your son cheered all of you up by saying it's tea time, even if you were all feeling sad because the playground service was being closed. Have a lovely weekend! I bet it was super hard to say good bye to a place you were going to for the last three years. Love how you paired your converse with the maxi skirt. It was a very sad goodbye, we loved it there. I haven't worn a maxi skirt in awhile but both of these outfits are lovely! The denim jacket paired with both of them was a great choice, and I love your new bag! The pink color is beautiful. I hope you have a wonderful weekend! Aw you look so nice. Love how you've styled everything! These photos are so cute! I love that orange bag, it is the perfect pop of color! You look amazing, babe! Wow! That second outfit with the light blue and red really caught my eye! It's a beautiful color combination! It's a perfect outfit for a sad day like that. I hope you have a great weekend! These really are perfect spring outfits. 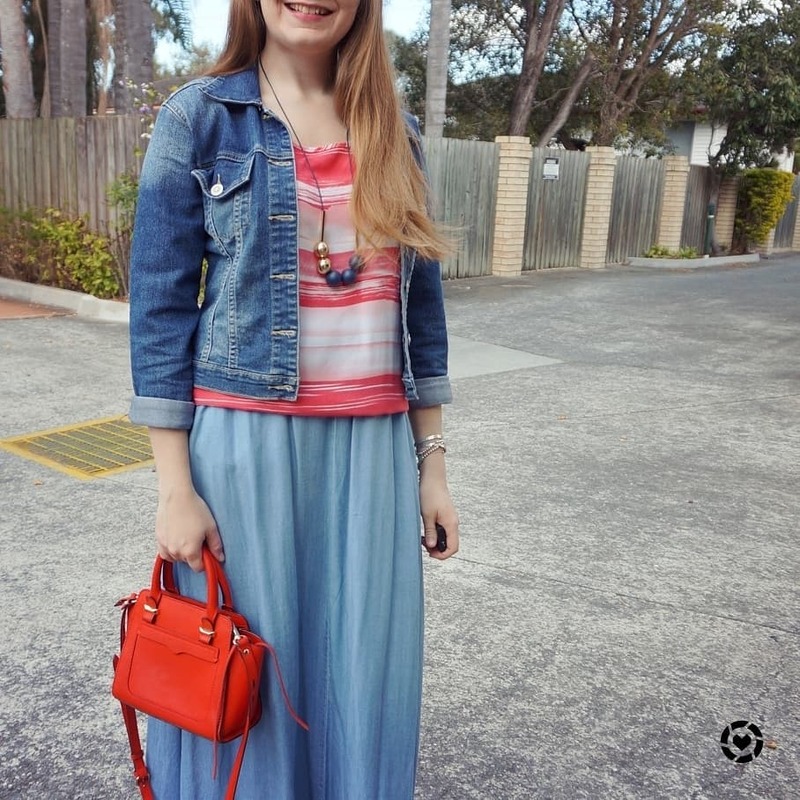 A denim jacket works so well with a maxi skirt for a dressy yet relaxed look. Both outfits are lovely. That second outfit is really pretty. 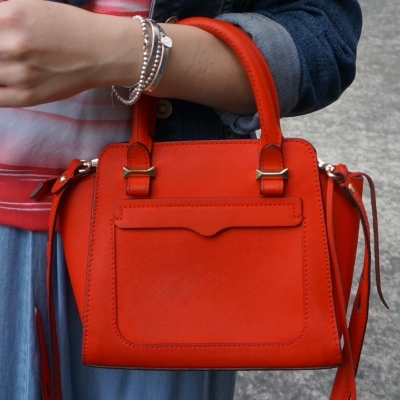 I love the color combo and that bright orange handbag! So sorry to hear your playgroup is ending. That's got to be so hard. Thanks Sasha! 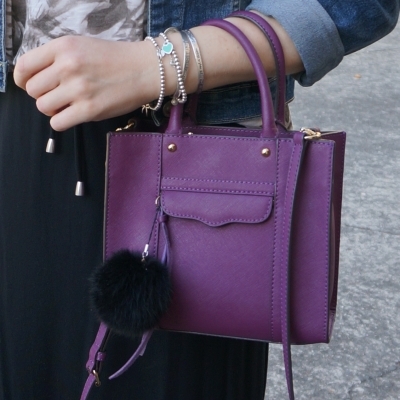 You'll see it popping up on the blog a lot soon as I have been enjoying wearing it lately, such a cute bag! Love that purple bag so much!! You have a very cool style babe. I love the slits on your skirt. These kind of skirts are my favorite! I really like the bright tank with maxi skirt. It is certainly hard to say goodbye, but I'm glad your little guy provided some levity. To new beginnings then! You really know how to wear maxi skirts, Mica:) Love both outfits. And that was really great to hear that there was a service to say goodbye to the playgroup building. It's always a sad event to have to go to, but that was sweet that your son was there to lighten up the moment. Oh my gosh, those little bags are just too cute! Love the colors. Both the bags are adorable! I do love that style of bag but find they're not that practical for carrying the things I need though! 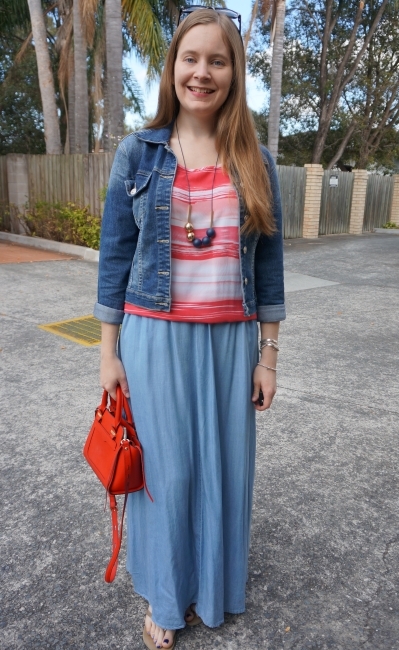 I really like the denim jacket and maxi skirt combo! Your outfits look so great and pulled-together but seem so comfy--I need to learn your ways! I live in sweatshirts and jeans haha. And I loved the "morning tea" comment, too cute!! 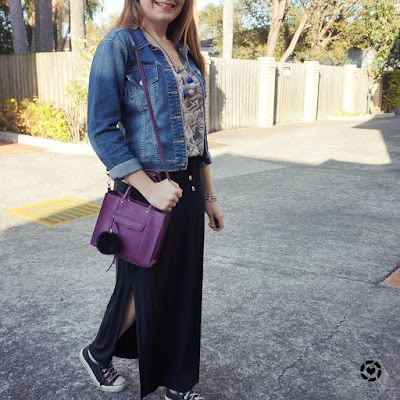 Love how you rocked the maxi skirt! Big plus when make you feel comfortable. I love the pairing with the Rebecca Minkoff bag. The blue maxi skirt is super cute! Hehe, denim jackets are great for giving coverage while looking stylish. It's a bit sad but I liked it that your boy made it better with morning tea remark. I missed you rocking maxi skirts - you are the best person I know (both virtually and not) to wear maxi skirt like queen. And those tiny bags are just gorgeous! i love the purple bag btw! I don't own a maxi skirt, purely because I'm so short and I can never find one that doesn't drag on the floor! I love how you've paired yours with your denim jacket - I've only just recently brought one and it's fab how much a denim jacket goes with year round! I'm petite too! I had to get the chambray one shortened but the other is fine, just worn a little higher than I would usually, ha! I really like how well you look in that second outfit. You really look casual, fun and comfy! Plus, you can never go wrong with a denim jacket. Aw, I can imagine how sad that must've been to say good-bye. You become so close with everyone throughout the years and some become almost like family. Kids tend to have that gift of making a sad moment a bit more cheerful, glad your son put a smile on some faces. I love the colorful outfit you wore, the blue and orange look so pretty together! LOL! Kids say the darnest things! Haha! Love the maxi skirts and how you style them, Mica! Love both of these looks. Obsessed with your bag collection! Such a cute story about your sons. I love those mini bags!! So so cute! Such a beautiful outfit. I really love maxi skirts, but your bags are amazing. They are so gorgeous. Oh that's awesome! I'd love to go to a sample sale one day, I can only shop them online and while the deals are good they aren't as great as they are in person! Great looks! I love the bags of both looks. It's getting colder where I live now and I wish I could wear outfits like this. Your spring fashion is making me super jealous! I love your printed tops! I love maxi skirts, they are so comfy and stylish. And they never get old. You can mix and match them with almost anything.